Early the next morning, after a relaxing overnight soak in his fountain, t'Nee pulls a loose thread from his backpack, drapes it carefully on the extended arm of his statue of Wastri, and mutters a prayer. He then rouses Burvik (by pouring a beer into his open, snoring mouth) and Shiori (very carefully, since she sleeps with her weapons under her pillow). 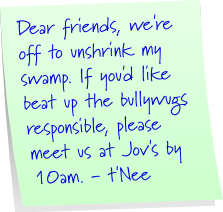 He also leaves a note in the common room, in case any of his other new friends would like to join their expedition. Once everyone is ready, they begin their trek to the Glade over on Green Campus to meet with Professor Robyn. Burvik's gear seems to consist of an axe and the bag of beers he packed the night before. As Sol and crew reach the grove, Robyn is waiting, faerie dragon perched on her shoulder. "What world do you hail from?" she asks. "That may suggest a solution if something similar has happened there before." "Fair," she says. "I trust you remember the portal you took to get here?" "Of course!" 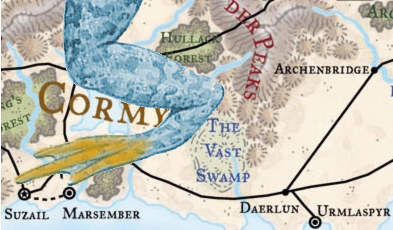 t'Nee croaks, "Suzail is like, less than a foot away from the Vast Swamp on pretty much any map, so it'd be pretty hard to forget." He produces a map of Faerûn and demonstrates. "Wait, this is happening in the Realms?" Robyn says. "Why hasn't anyone... I'll meet you at the portal. I need to talk to a couple of people, and send a message to Elminster." She waits for acknowledgement then hurries off. t’Nee shrugs, puts away his map, and turns to Shiori and Burvik. The group reaches Jov's in short order, the tall arcane making his usual greetings. "Where can this humble servant direct you today?" "Uh, hi Jov, we're waiting on Professor Robyn and maybe Elminster, but are headed to Suzail." "What is your swamp like?" Shiori asks, to fill the time while they wait. "Besides small. Or, uh, less vast than it used to be, anyway."